Pacific Island Countries: "Welcome to the Heroic Delegation of Tuvalu"
On the 20th of September, the delegation from Tuvalu submitted to a formal review of their initial report on how Tuvalu was implementing the provisions of the Conventions of the Rights of the Child (CRC). 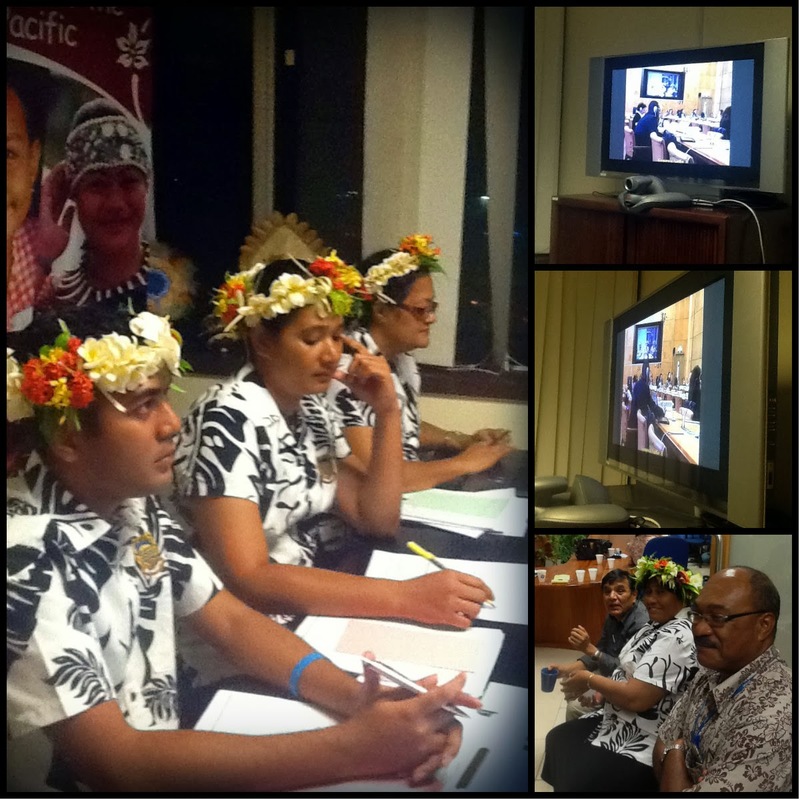 The review was conducted by the Committee on the Rights of the Child in Geneva, Switzerland via videolink from UNICEF Pacific's head office in Suva, Fiji. Tuvalu had ratified the CRC in 1995 but, as a small island developing state with limited human and financial resources, had faced significant challenges in implementation. The Delegation of Tuvalu included representatives from the Ministry of Education, the Office of the Attorney General, and the Office for Childhood. This was their first review since the ratification of the CRC. The delegation of Tuvalu was dressed in cultural attire adorned with their native traditional head garlands. This display of Pacific heritage was greeted with warmth by the Committee in Geneva. The Chair of the committee called the delegations appearance as "inspiring", and another committee member memorably started his line of questioning with the words, "Welcome to the heroic delegation of Tuvalu." In the opening remarks from Tuvalu, the Head of Delegation reminded the committee members of the significant challenges faced by Tuvalu as a small island developing state with limited human and financial resources. Tuvalu was the second smallest member of the United Nations in terms of population, and the fourth smallest country in the world in terms of territory. It consisted of nine islands which were isolated both from each other and from the rest of the world. It took at least one day to travel from one island to another, and some of the islands were only accessible by boat. Its geographic situation hindered consultations on international instruments and human rights treaties. Tuvalu heavily relied on the Office of the Attorney General and there were only nine lawyers in the country, despite an increased need for legal expertise and services. The country's eight Ministries, which contained various departments and units, were all understaffed. For example, only seven staff members worked in the Ministry of Education. 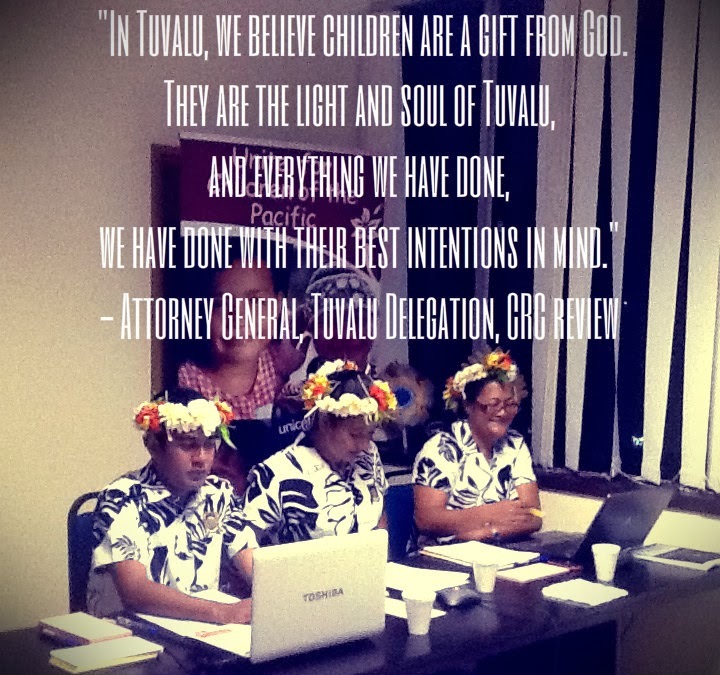 Tuvalu did not have an independent mechanism for children but did have a National Advisory Committee for Children which was part of the Ministry of Education. There was a need to foster and further develop the Advisory Committee in order to address child-related issues more effectively. During the interactive dialogue, Committee Experts said that they understood the serious challenges Tuvalu faced and commended its efforts. Experts also addressed, among other issues, climate change, data collection, birth registration, and the need to amend existing laws in order to bring domestic legislation in line with the Convention. Questions were also asked about health and education, sexual violence, measures to improve the situation of girls and children with disabilities, and restrictions placed on the freedom of religious belief. In the committee's concluding remarks, Committee Expert and Country Rapporteur for Tuvalu, Ms. Hiranthi Wijemanna said that the Committee fully understood the challenges facing Tuvalu. 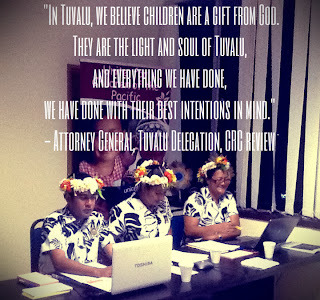 It was very positive that, despite those challenges, Tuvalu was working to safeguard the rights of children. The dialogue with the delegation had been very constructive. In her concluding remarks, the head of delegation of Tuvalu stated that Tuvalu had the best interests of the child at heart and thanked the Experts for their comments and questions. Tuvalu was grateful that the Committee understood the serious challenges it was facing, including the devastating effects of climate change, and was counting on receiving assistance from the international community, including from the United Nations. Despite its vulnerabilities, Tuvalu remained fully committed to protecting the human rights of its population, especially the rights of its children.